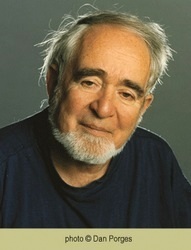 Natan Zach was born in Berlin, Germany, in 1930, and immigrated to pre-state Israel as a child. After teaching at Tel Aviv University for a number of years, he moved to England (1967-1978), where he completed his PhD at the University of Essex. On his return, Zach was appointed professor at Haifa University. He has also served as chairman of the repertory board of the Ohel and Cameri Theaters. A poet, critic, editor and translator, Zach has exerted great influence on the development of modern Hebrew poetry. He was the leader of a group of post-Independence poets who changed the face of Hebrew poetry in the 1950s and 1960s. Zach has been awarded the Bialik Prize (1982), the Israel Prize (1995), the Camaiore Prize (Italy, 2000), the Levy Eshkol Award (2001), Premio dell'Unione di Lettori Italiani (Italy, 2001), the Feronia Prize (Italy, 2003), Cultural Ambassador of Rome (2002), and the ACUM Prize for Lifetime Achievement (2003). Most recently, Zach received an Honorary Doctorate from the University of Geneva for "his contribution to the renewal of poetry in the second half of the 20th century" (2004), the honorary title of Cavaliere from the Italian Government (2007), the Gabriele d'Annunzio Prize (2009), the Premio Napoli (Italy, 2010) and the Aquila Prize (Italy, 2010). His work has been published abroad in 23 languages. known what then I didn’t know. hollow as a cave, hard as stone. My son, I never knew you were, this much, with me. Italian: with Adonis: Rome, Quasar, 1993.